Gone are the days when Bluetooth headsets were only for the business elite (or maybe business dorks). They aren’t just there for taking calls — they can also be used as a portal to your digital assistant and provide you with vital information when you need it, without the need to pull out your phone. There are a ton of things to consider when buying a Bluetooth headset, however, such as battery life and audio quality. If you need your headset available to you all day, for instance, battery life might be the first thing to consider. You also want to keep design and various features in mind. We also have a list of the best wireless earbuds for music streaming. So which Bluetooth headset should you get? With all the options out there, it can be a little difficult to decide. Below are some of our current favorites. Why you should buy this: With excellent battery life, great design, and top audio quality, this is the Bluetooth headset to beat. Who it’s for: Those willing to spend a little extra for the best. When buying an audio product, you might want to consider an established name in the audio world — like Sennheiser. Sennheiser has long been a dominant force in both consumer and pro audio, and for good reason. The Presence is a pretty sleek device, one that is certainly a lot fancier than many of the other options on our list. The design is a combination of black and silver with a MicroUSB port for charging, and an LED light on the back. It features an ear hook like most Bluetooth headsets, but unlike others, that ear hook can be removed and attached as needed. The device utilizes Bluetooth 4.0 and implements Sennheiser’s “SpeakFocus” tech, which is designed to enhance voice clarity in all scenarios. It also uses the company’s WindSafe tech, so it eliminates — you guessed it — wind noise. Plus, Sennheiser claims it will last between eight and 10 hours on a single charge. Why you should buy this: The Jabra Stealth is probably the best-looking device on this list. Who it’s for: Those who care about how they look. The Jabra Stealth is aimed at being sleek and stylish, while still offering excellent functionality. The Stealth is perhaps most notable because of its design — it’s arguably the most stylish headset on the list, thanks to its sleek arm and discreet earpiece. In other words, this may be one of the few headsets that won’t draw immediate judgment as you walk down the street. The Stealth offers a range of unique features. For starters, you’ll get Jabra’s “Noise Blackout” technology, which is aimed at ensuring clear calls without any noise in the background. On top of that, the device offers Jabra’s “microPOWER” battery, which helps give it its six-hour battery life. Sure, that’s not incredible, but for such a small device with a likely small battery, it’s pretty darn great. Why you should buy this: With an arm for superior audio and a seven-hour battery life, this is an excellent headset for its price. Arguably a little less stylish than the Jawbone Era, the Plantronics Voyager 5200 looks a lot more like what you might expect a Bluetooth headset to look like. While it won’t win any awards when it comes to design, it still has a lot going for it. The Voyager 5200 hooks around the ear, so you won’t need to worry too much about it falling off, which is great for those that fast-paced lives. The design is completed by the small microphone arm, which is noticeable, but not overly large. Plantronics says the device should last up to seven hours on a single charge, though we suggest being a little conservative and estimating around five to six hours. That is still not bad. Like the Era, the Voyager 5200 also has an optional charging case, which grants the device two extra charges. The Voyager 5200 offers excellent audio quality, too, and while the noise cancellation may be a little too aggressive for some tastes, it helps mute background noise in spades. The device can even withstand a few raindrops if it needs to, given its IPX4 rating, meaning that splashes of water from any direction shouldn’t harm the device. Why you should buy this: With a rugged design that’s dust, water, and shock-resistant, this is the toughest headset on the list. Who it’s for: Those who work outdoors or in noisy or wet environments. The Jabra Steel has a very simple, straightforward, ruggedized design. It’s two-and-a-half-inches long with an optional ear hook to hold it in place. It scores an IP54 rating, which means it can handle rain and dusty environments, making it ideal for anyone working outdoors. There are extra-large buttons, so you can operate it, even with gloves on, and it supports voice commands for hands-free operation through your phone’s voice assistant. You will find pairing via NFC is an easy option, and you can connect two devices simultaneously. It also boasts aggressive noise cancellation, which is great for loud environments. The audio quality is good, and you get a reasonable six hours of talk time when fully charged. Why you should buy this: With on-ear buttons and a secure, natural headphone design, this headset will help you manage your business at home. Who it’s for: Those that want a headset for home or office use only. Sometimes you’re not looking for a headset to use on the go — sometimes, you really need something to use at home. That is what the Plantronics Voyager Focus UC is here for. While certainly bigger than the other headsets on this list, the device is almost certainly more comfortable, plus it features call control buttons right on its ear. You’ll also get noise-canceling capabilities, ensuring the person on the other line can always hear what you’re saying. Other features include a huge 12-hour battery life, along with a dynamic mute alert that tells you when your microphone is muted, plus the ability to quickly and easily customize the headset with the Plantronics Hub for mobile and desktop. Now is as good of a time as any to buy a Bluetooth headset. While it seems like most companies have slowed down a little in releasing headsets, if you’re in the market for one, there is no reason not to buy one right now. On top of that, there are plenty of options available, even for those who don’t want to spend much money because they don’t think they’ll use a Bluetooth headset all that often. When choosing a headset, you will want to consider a number of different metrics — and one that many people forget is design. Keep in mind, this is a device you’re going to wear on your head, so you want it to look decent on top of working well. In reality, most people don’t need a Bluetooth headset, as wired or wireless earbuds should suffice. But then again you probably wouldn’t be reading this if you hadn’t already decided that a Bluetooth headset was something you might need — either for your personal life or for your business. 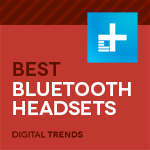 Here at Digital Trends, we pride ourselves on being experts in tech, and that includes Bluetooth headsets. Whether it be audio specifications, how Bluetooth works, or why current design trends are in, we know what we’re talking about. For this particular list, we put in the necessary time and research to go through hundreds of different headsets and determine which headsets are best for each category. That’s not to say they will be the best forever — they will be overtaken eventually. But for now, we’re confident that these are indeed the best Bluetooth headsets around.